I was eight when I walked past the Trevi fountain with my dad for the first time. 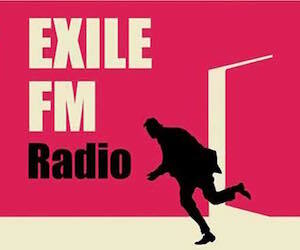 He’d chosen Rome as his next assignment in his job as foreign correspondent for United Press International. He’d spent time here as a journalist in the 50s and loved it. No matter how much time you spend away, he said, Rome never changes. It really is the Eternal City. Here I am with Moto Guzzi in Rome, 15 years after leaving Italy for the UK, riding past my mum’s favourite restaurant down the road from where I spent my childhood and teens. And it’s still standing. So are the garage, the flower shop, and the bar I’d stop at for a Cappuccino in the early hours of Sunday mornings on my way back from clubs. Not even the shop signs have changed which makes everything look really old. 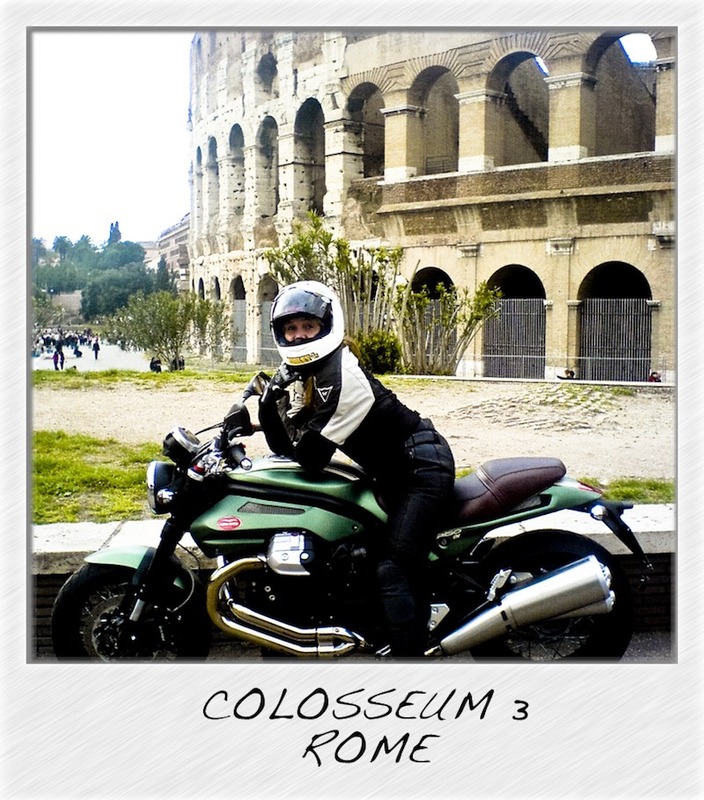 And it’s here in Rome that I nurtured a love of bikes that has dominated the rest of my life. My dad, a World War Two hero decorated with the Military Cross for bravery (he’s also 20 years older than my mum, and a year older than my mum’s mum, go dad! 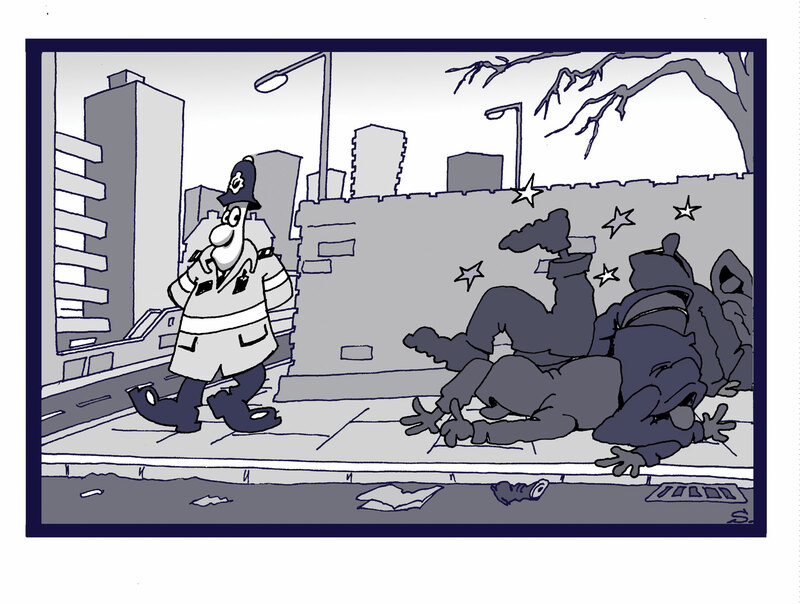 ), always forbade me to go near motorcycles. He was on the front line in Italy, but insists the time he came closest to death in the war was on his motorcycle. I disobeyed, of course. I could never afford a bike of my own. But it didn’t stop me riding pillion everywhere I could. 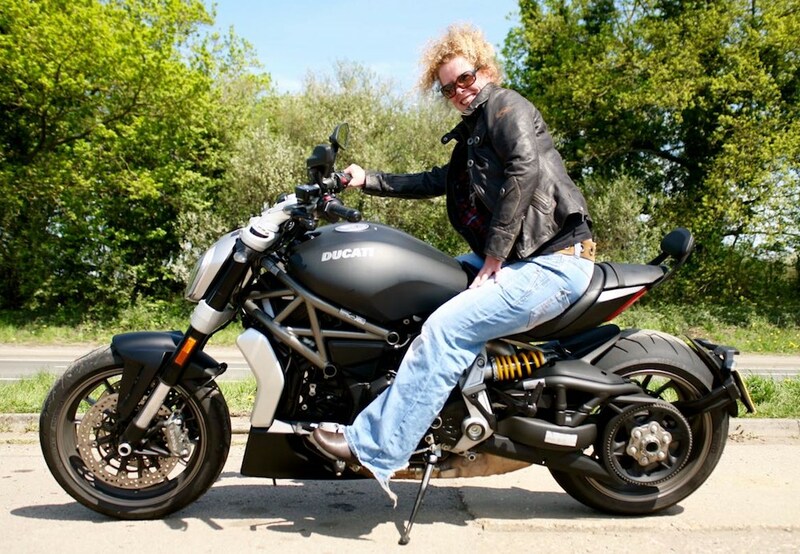 It all started at the age of nine when my best friend Francesca’s dad had what I remember as being a HUGE Moto Guzzi (or maybe I was just very small…). I’d go to her house after school and her dad would carry us there in turn pillion. It was awesome. I loved the ride to Francesca’s house way more than playing silly dolls with her. Then one day, when I was 11, I was walking down Piazza dei Giochi Delfici on my way home from school. I stopped in awe as a girl with long flowing hair sat astride a big trailie-style motorcycle at the lights. She looked so cool. I promised myself that as soon as I could, I too would have my very own motorcycle. After months together Giovanni and I split up. How I missed his motorcycle. 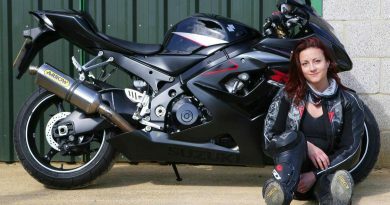 I was just 17 when I promised myself for the last time that as soon as I could, I’d pass my test and get my very own motorcycle. A couple of years later I was back in the UK roaring around on my first proper bike. There’s a lot of nostalgia going on with Moto Guzzi too. The famous Italian marque is still trading on the glory days with retro-style bikes such as its new-for-2009 V7 Café Classic, updated Nevada V750ie and Griso 8V SE (that’s Special Edition), which I’m taking in turns to ride across Rome and beyond. The V7 Café Classic is basically the same bike as the V7 Classic launched for 2008, but with the low, slanted handlebars of a café racer. And it seriously looks the part. 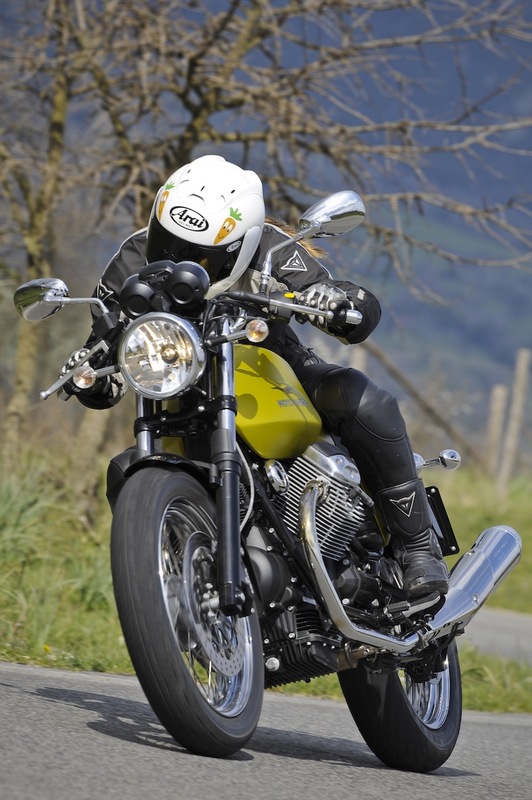 Moto Guzzi is keen to appeal to a young customer with its V7 Café Classic. A crowd who wouldn’t remember the days when Moto Guzzis won all the races and built the most beautiful bikes. 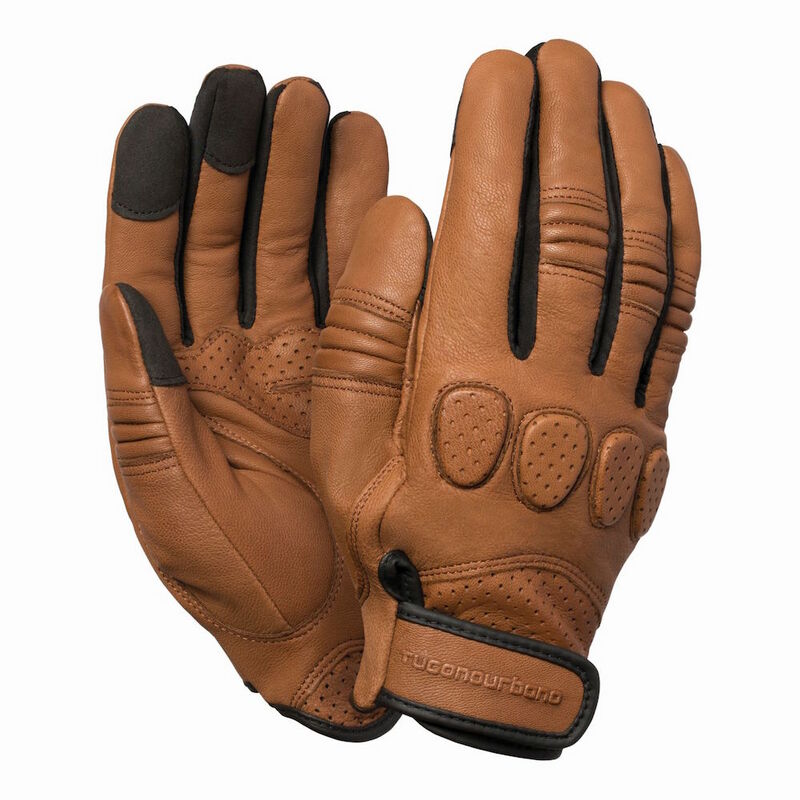 But it doesn’t matter because anyone can see the V7 Café Classic, like the V7 Classic, looks stylish and straight out of a motorcycle history book. The seat is for the rider only on the standard bike, but big butts are in as it’s very spacious (a twin seat and pillion footrests are available as optional extras). I feel instantly comfortable as I swing a leg over the Café Classic. My five-foot-six frame fits the bike beautifully and you would be alright if you were a lot shorter as the seat is low. But you can’t afford to be much taller. One of my six-foot-plus companions had his knees up against the handlebars, plus he looked a bit silly dwarfing the bike (sorry long tall Kev!). The twin cylinders on the V7 Café Classic sound so cool I can’t stop revving the engine like I’m about to start a drag race. 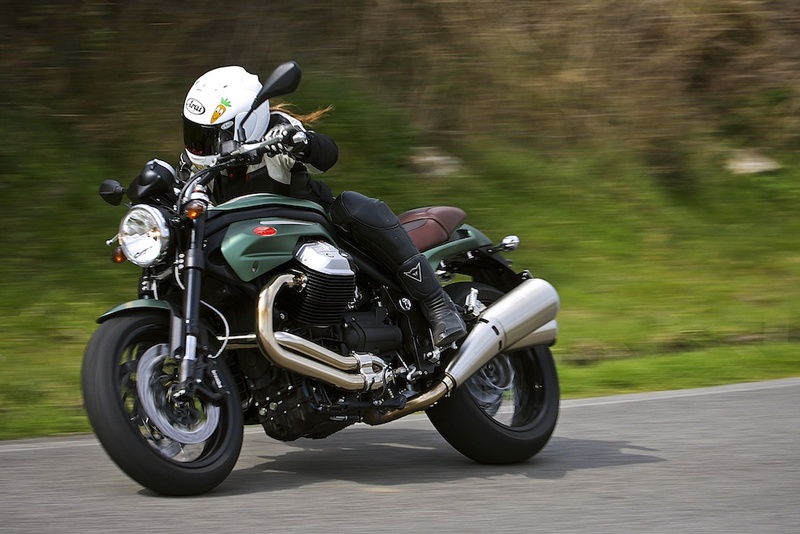 I’m sure the Moto Guzzi engineers have played about with the exhaust harmonics to perfect that deep, raspy growl. The engine has plenty of low-down punch, which is brilliant in traffic, and power comes in smoothly with no jerks as you roll on and off the throttle. It pulls from very low revs and there’s no power band, just more strength as the revs climb towards 7000rpm, after which it tails off. 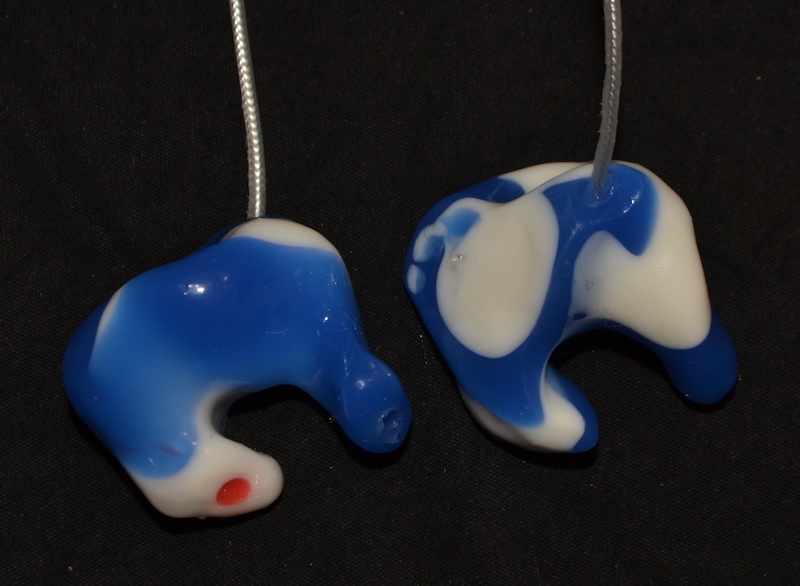 If you’re experienced and like a bit of speed, you’ll find it runs out of puff pretty quick. I had to keep the throttle pinned round the corners to keep myself amused. It only puts out just under 48bhp – that’s a good 5bhp down on my 1995 Ducati 600SS Desmodue racebike. 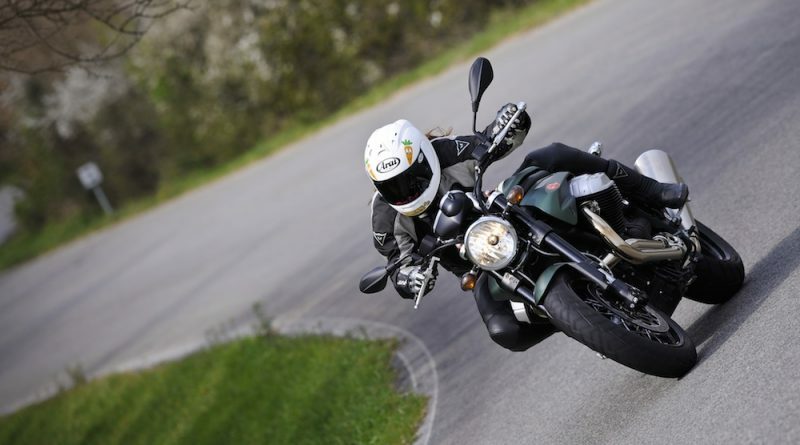 I suppose this Moto Guzzi is spot-on for people new to biking though, or for Moto Guzzi enthusiasts who love to gently flow through the twisties rather than dust off all-comers as naughty me prefers to do. The Nevada is the same as last year but with a new instrument panel, horizontal rather than slanted exhausts and a different finish. It shares the same fuel injected, two-valve, 90° transverse-V engine and running gear as the Café Classic (and Moto Guzzi’s Breva 750) so the bike feels (and sounds!) much the same. Except it looks completely different in its cruiser clothes. The Nevada’s a breath of fresh air in the class. The styling is subtle, displaying all the low-slung cruiser lines and curves without the excess of chrome or other extremes. 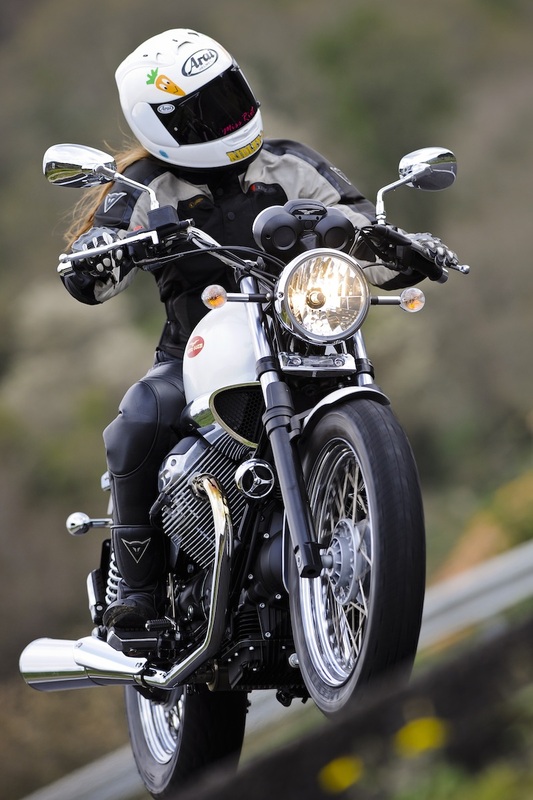 But I still cringe when Moto Guzzi tells me the pearl white Nevada is built with girls in mind. Apparently, girls like cheesy cruisers plus it’s easy to ride so even ‘girls’ can handle it. Humph! But the chassis does display an agility you expect to sacrifice when you buy a cruiser. It handles sweetly, neither understeering nor dropping awkwardly into a turn. 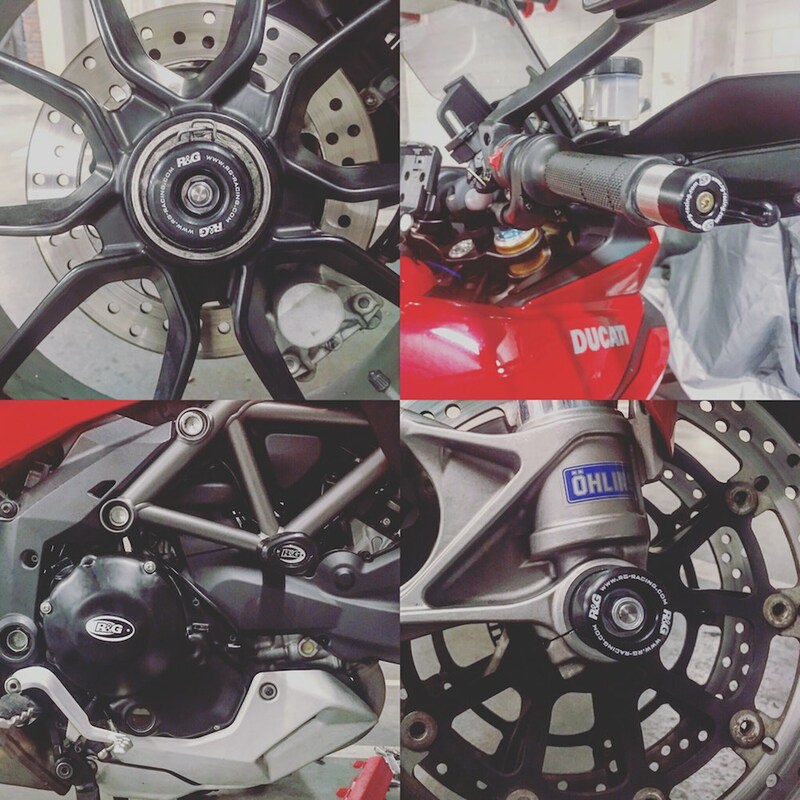 As on the Café Classic, the lightweight clutch engages smoothly while the gearchange – in complete contrast to the reputation of Guzzi transmissions – is quiet, light and dependable. Plus the riding position’s super-comfortable. I don’t hesitate to jump on the Nevada for a relaxing cruise back from Lake Bracciano. Yes, that’s right. 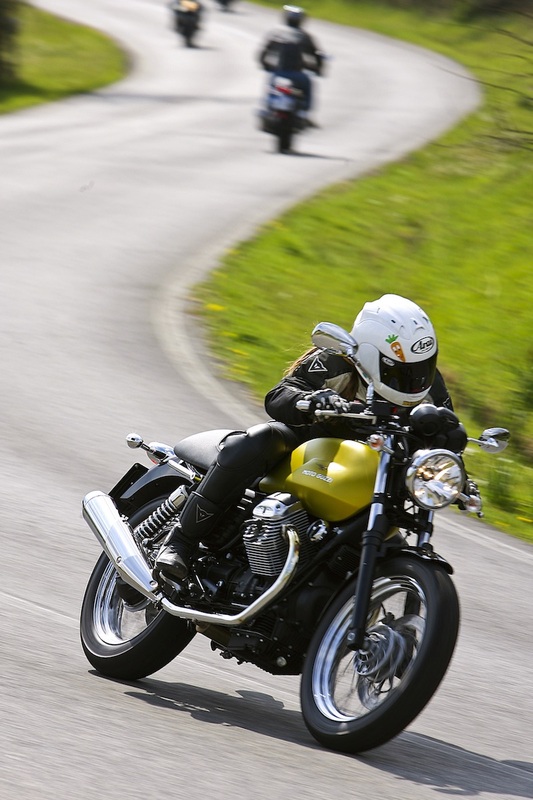 Moto Guzzi led a ride to Lake Bracciano, scene of my bikini-clad pillion riding madness! Except this time I was wearing full leathers with a helmet firmly planted on my head. 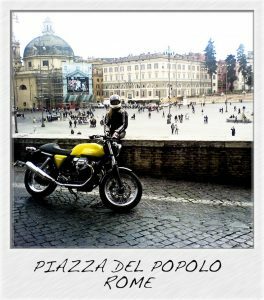 But when it came to posing around Rome trying to look cool like all the other Italians do, I opt for the V7 Café Classic with its gorgeous green/yellow matt colour and retro style. The special edition Griso looks even more impressive and may have caught an even greater number of roving eyes from passers-by. But the Café Classic is smaller and more agile and therefore easier to weave in and out of the crazy Roman traffic – which is even worse than I remembered. 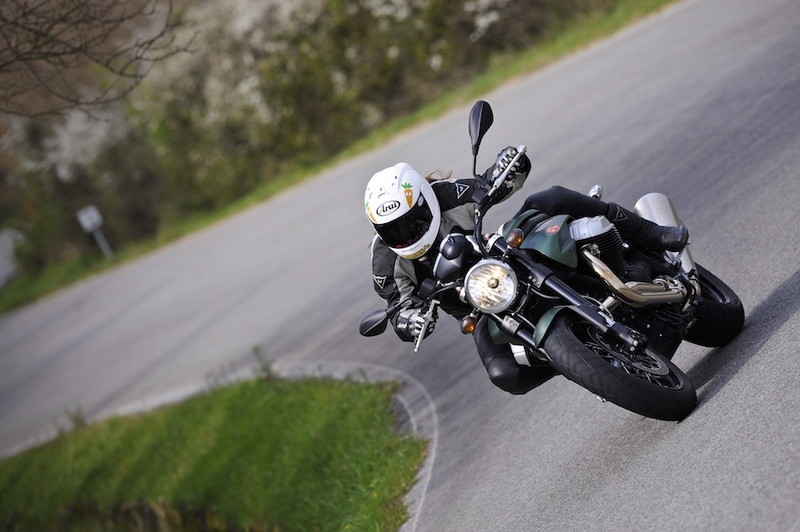 But first, let me tell you about the Griso 8V SE, my definitive weapon of choice for the Bracciano twisties. 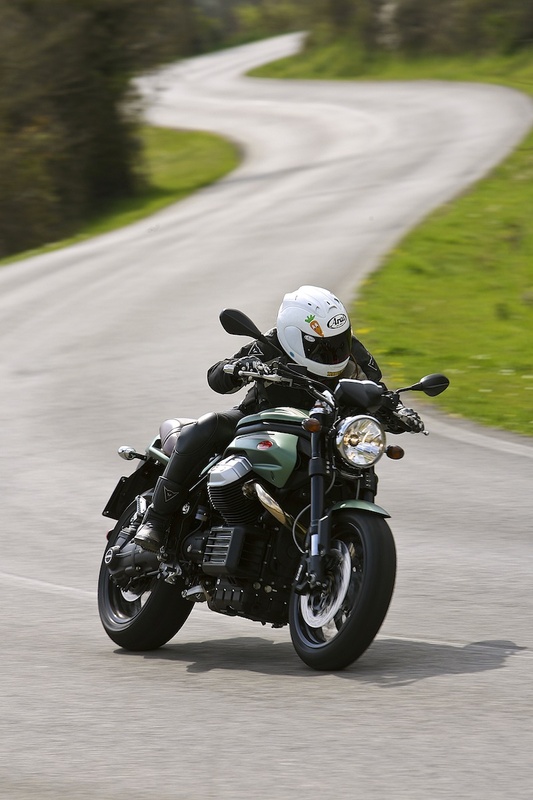 The Moto Guzzi Griso is unlike anything I’ve ridden. It has a completely unique, gorgeous, hunky style with a strong, torque-laden engine. One side of the bike is all chrome and flowing exhausts, the other is all big engine, single-sided swingarm and hefty Guzzi-patented shaft drive system. The Special Edition gets little more than a fabulously retro matt green paint job and tan leather seat to set it apart from the original, but any excuse to travel to Italy to ride this shapely motorcycle is a good one! Fire up the engine and the strong side swaying from the air-cooled 1151cc 90º transverse-V engine with eight valves (four valves per cylinder, even I can do those maths) almost knocks me off my feet. It’s the action and reaction caused by those famous transverse cylinders with the crank that spins sideways instead of front to back. BMWs also have transverse cylinders, but the Bavarians counteract it with the movement of the clutch to cancel out excessive swaying. After an initial strong sway the Griso settles down and you can feel the torque oozing out of every engine bolt. You can take a slow corner in a high gear and there’s still enough grunt to drag you round then propel you manfully forward to the next turn. The riding position is comfortable and imposing. You’re sitting on top of the Griso rather than in it, as if you’re ready to attack the road ahead. While the seat is low, the bike is wide so shorter people would struggle to touch the ground. I’m ok, although the weird positioning of the sidestand way out in front means I need a telescopic leg to reach it. Despite the massive and heavy shaft drive contraption, the bike handles beautifully, no doubt because the weight is carried so low. Rather than dropping sharply into corners, the Griso obediently goes where you want it to, remaining stable and reassuring. What a bike. 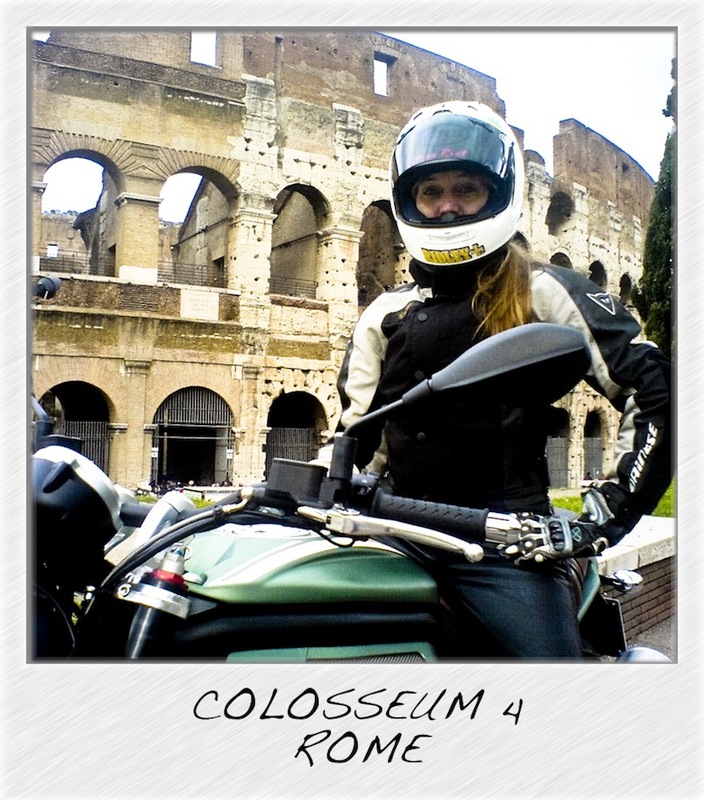 As I hit the centre of Rome on the Café Classic, I suddenly remember the need to wear a sports bra when travelling across the small and uneven cobblestones. It’s not that the suspension is bad. 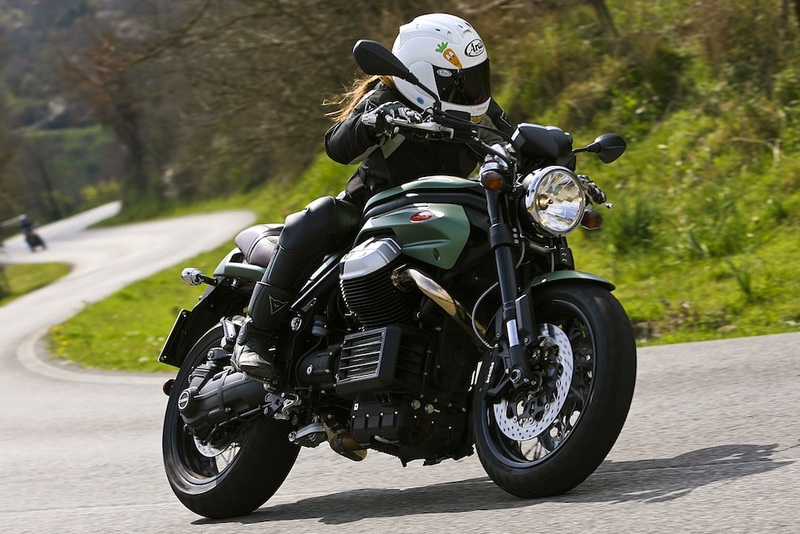 In fact, it’s as good as you’d wish for given this Moto Guzzi’s decent price (the V7 Café Classic will cost £6,270 when it becomes available in April and the Nevada costs £5,975); it’s just that in Roman times they didn’t consider making the streets smooth for us future motorcyclists. 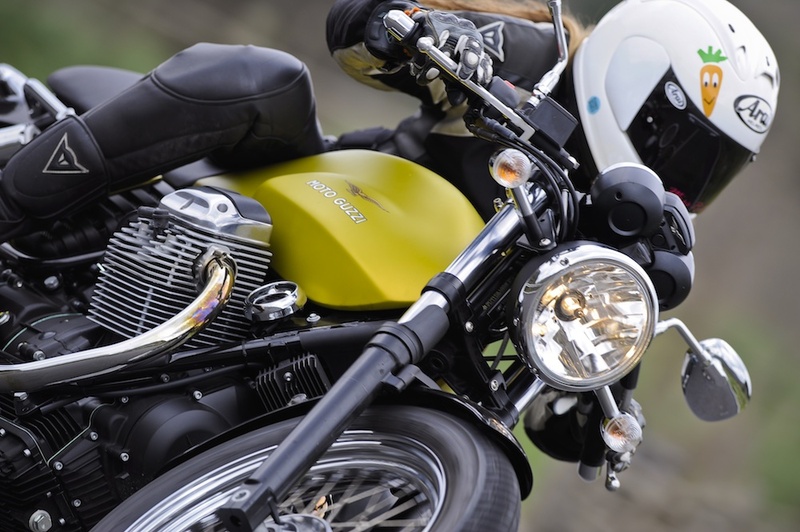 The Griso SE is clearly more expensive (£9,211), but it’s a lot more of a motorcycle built with the more experienced Moto Guzzi enthusiast in mind. You know what it’s like when you live somewhere. You become so jaded with the sites that you never bother to do the tourist thing. The same applies to growing up in Rome. I’d become so used to strolling round the corner to be confronted by some majestic ruin that I never thought twice about it. But I’ve become wiser with the odd extra year (ok, decade…) and now I don’t live there anymore, I’m amazed to find all these fantastic monuments packed so tightly together. It’s like living on a postcard rack in a souvenir shop. 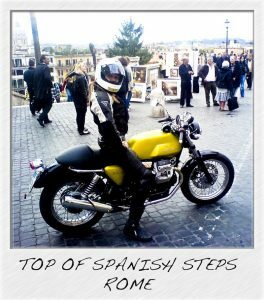 Twist the throttle and you find yourself at the top of the Spanish Steps. Straight line it and there’s the Pantheon. Turn the corner and you’re at the Coliseum. Awesome! My favourite memories are at the Spanish Steps where I spent my teenage years hanging out with friends and travellers, the warm air filled with the sounds of guitars and bongos. Nothing seems to have changed here. I keep expecting to see old friends stroll up the steps clutching large brown bottles of the cold Peroni beer we used to drink through the night. Of course, no familiar faces show up among the sea of tourists. Plus Peroni beer only seems to be available in the disappointingly small Nastro Azzurro green bottles nowadays. As we head for the Coliseum I push Kev off the Griso to take ownership. It’s the kind of bike you’d imagine a Roman gladiator riding, especially a hunky one like Russell Crowe. Or a proper girl of course, so I had to be seen riding it here. Despite my 12 years in Rome, I’d only ever ventured inside the Coliseum twice. The first time was with my mum who dragged me there as a child one scorching summer’s day when I’d have much rather stayed by the pool. The second time was in my teens with, you guessed it, Giovanni! We rode there at one in the morning, parked the bike outside then clambered the gates and sneaked in to smoke a, erm, cigarette. It was spooky sitting inside the Coliseum amid all the ruins with a full moon shedding the only light. But I had hunky Giovanni and his Honda Super Bol D’or (did I mention he had a motorcycle?) to protect me from the ghosts of the lions. Two days spent in Rome had me revisiting my youth, touring sites haunted by memories and riding bikes in places I’d spent years dreaming of one day riding them… But that was quite enough. By the end of day two I was ready to go back to the future and my life in Britain. It’s not good being stuck in the past for too long. 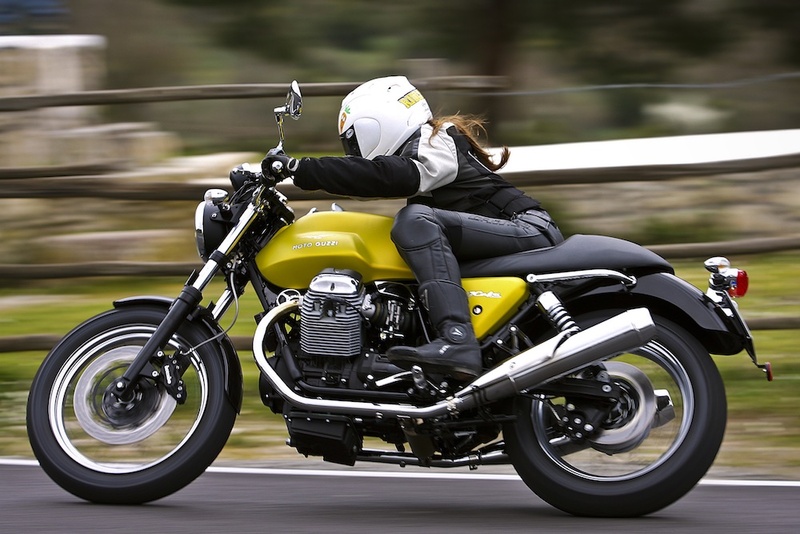 Moto Guzzi knows this too: Although their bikes have the cool retro look, they’re firmly rooted in the modern world with up-to-date parts – the Griso SE even gets radial brakes – and strong performance. The Nevada and Café Classic are ideal machines for the new rider who wants a stylish and gentle ride to learn on, or for the enthusiast with a rose-tinted visor who loves the look of the good old days but still enjoys a modern ride. As for the Griso SE, it’s a real woman’s (or for those stuck in narrow outmoded thinking, man’s…) bike that’s exciting and fast, stops and handles as well as you’d expect from a motorcycle these days and has unique looks to die for. 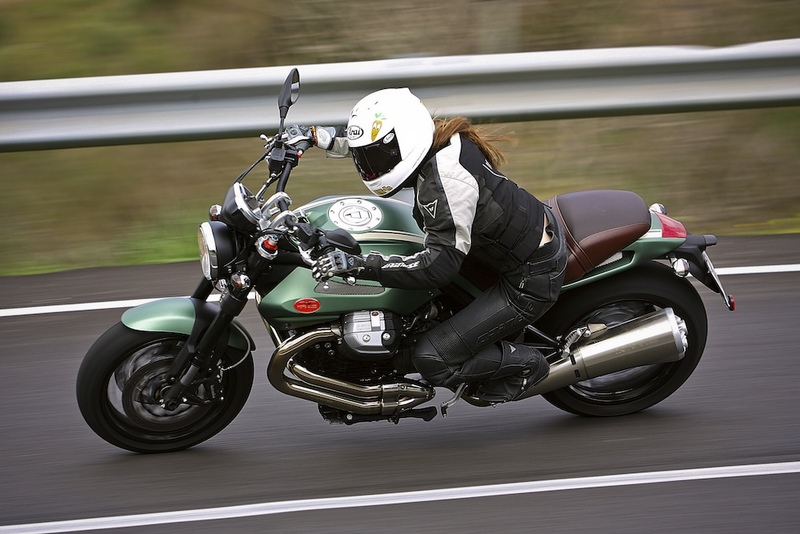 The years have rushed by, yet the Moto Guzzi brand is still going strong. Nostalgia really is big business.